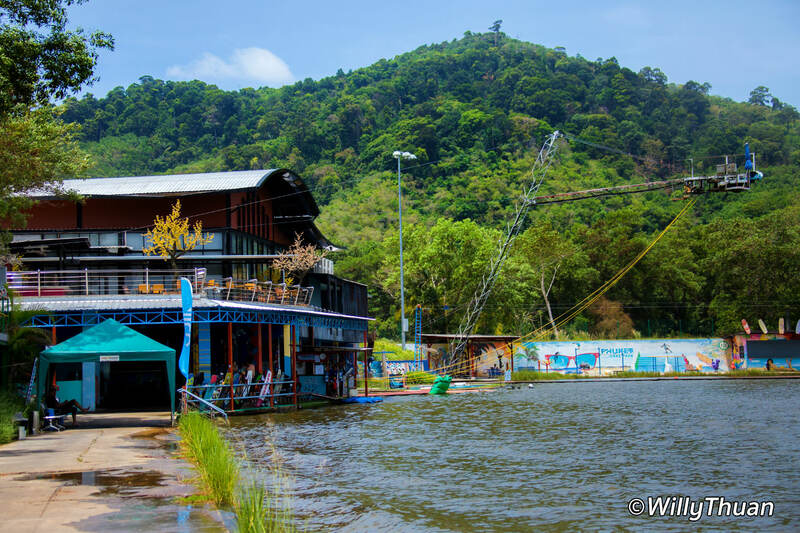 Where is Phuket Wake Park? 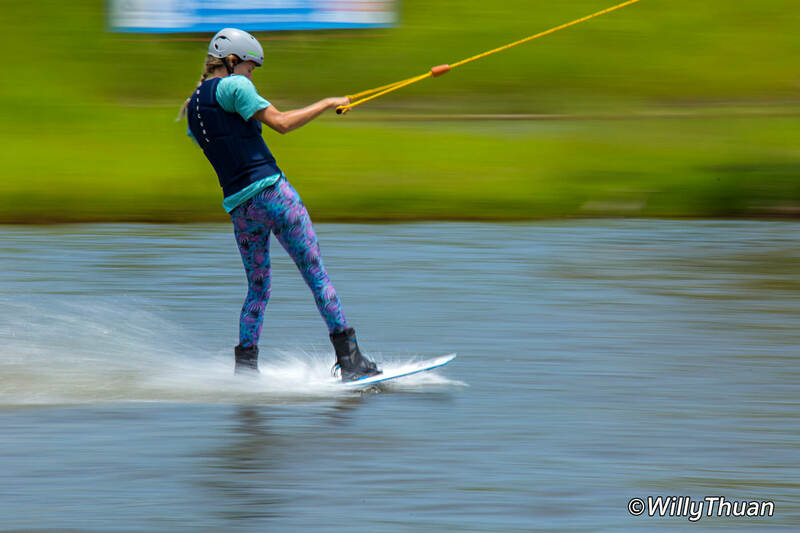 Phuket Wake Park (Phuket Cable Ski) has been in Kathu for long time, but only in recent years we started this thrilling sport. And wakeboard is much easier to enjoy than one would imagine! You will be surprised how fast you will succeed and how much pleasure you will get for each little step done. Wakeboarding is expensive… 950 Baht per hour but they have some cheaper options (see end of page). 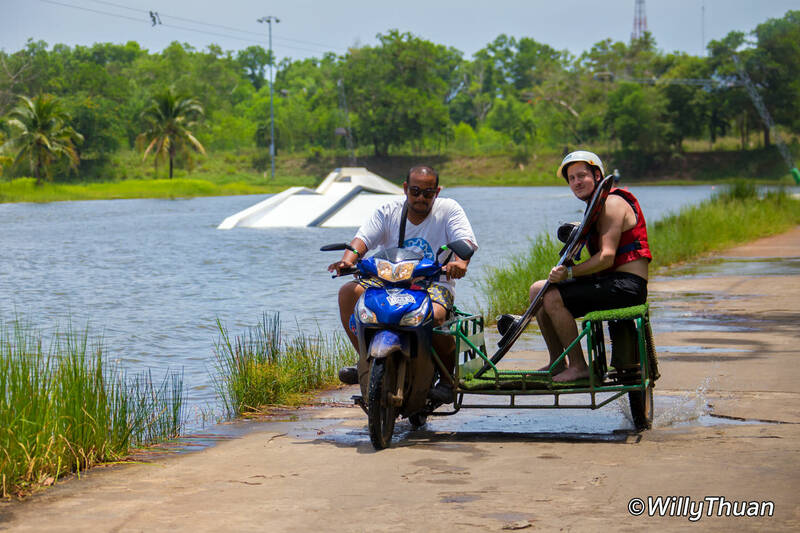 They do have longer and cheaper options, but if it’s your first time, you won’t survive one hour of this intense sport, even kneeboard is exhausting and will leave you happy, but panting. Oh, you better plan a spa or at least a beach massage after that… I promise you, the next day will be painful! Almost anyone can succeed instantly on a knee-board, it is simple, exciting and a lot of fun. And if it is your first time, you’ll get plenty of speed feeling as you really glide close to the water. Knee-board will also allow you to succeed the two most difficult moments for a cable ski beginners: take off and succeed your first curve. You will fall, no doubt about that, but it won’t hurt (yet) and staff will come and pick you up in no time on their motorbike with sidecar. The cable rotates permanently at an average speed of 26km/h around an elongated O shape lake with a island in the middle. A series of numbered hooks are attached to it. People queue on a platform at the start station and staff will hand you the rope before the hook approaches, so you have time to get ready. The hook will catch your rope and off you go. No rush, no stress. Staff will also be there to teach you the basic of each options, and beginner’s equipment is free of charge, so you can just show up with your swimsuit (and your money of course). Once you have achieved your few rounds on a kneeboard, you’ll start noticing some cool guys around doing some pretty cool jumps (like me). So it’s time for you to move on to the next level. Staff will recommended few rounds on double ski to get a feel for the ‘standing’ position, but it’s horribly boring and heavy, plus trying to negotiate a curve with two skis is a knee nightmare. 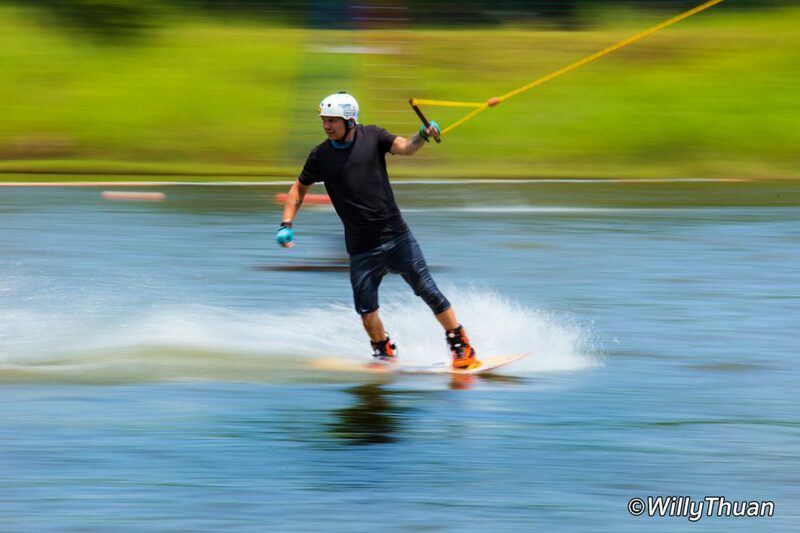 Up to you to try it, but what you really want to play with is WAKEBOARD! So you are now ready, all nervous and impatient. 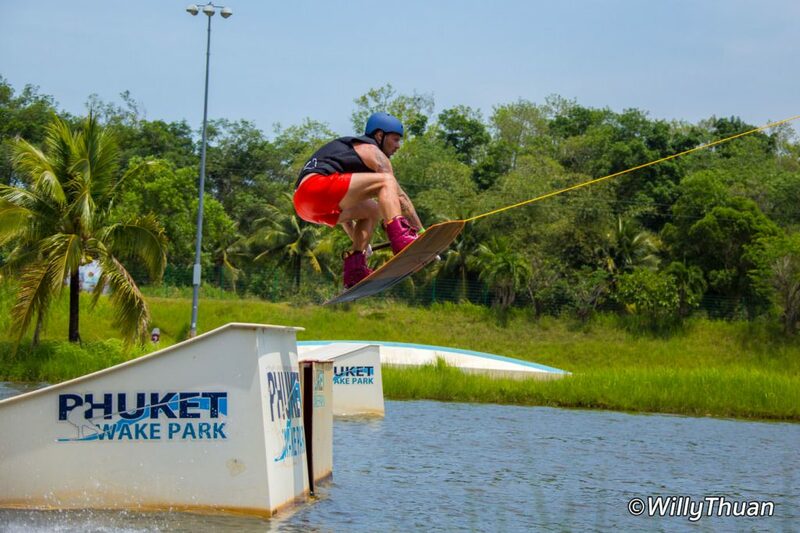 Phuket Wake Park Crew will let you borrow one of their old wakeboards with a pair of massive but light shoes attached to it. Don’t worry, these old wakeboards are good enough for what you are about to do: take off and crash. Once again, it won’t hurt, unless you forget to let the cable go and you’ll do what they call a ‘Superman’; bouncing flat on the water. You won’t do that twice, you will never forget to let go the rope. First you’ll start on a ramp, more or less sitting on your wakeboard. If you manage not to fall when cable pulls you out, your next challenge will be to stand up. Tricky. And once you do, your success will be short, the curve is not far and not many succeed both challenges in a row! Pass that point, you are all set to get going round and round for hours with a silly smile on your face. But soon, you’ll get bored… once again you’ll look at these cool guys doing casual jumps with one hand while chatting with the girls waving on the lakeside (me again). You might need to rent a proper wakeboard or start investing in your own… and you’ll need a helmet. Ramp jumping is fun and not too hard, all you have to do is to align yourself well (at beginner’s level) and bend your knees when you are about to enter the ramp. Landing is also tricky, but I’m not going for a full lesson here, you’ll have to do a lot of swimming. Last, you want to go for the real corner jump, or even a flip to hear ‘oh’ and ‘ah’ and have your photo taken by the ecstatic visitors… Well, that’s not me, to my shame, I never succeeded that one. I tried but crashing while attempting this kind of jump is like being hit on the face by a wrestler. 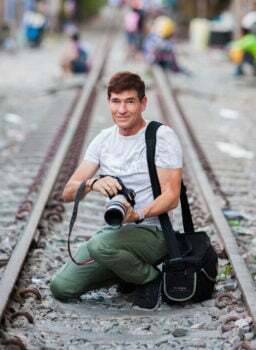 You think twice before you try again!